How do I invite guests through WhatsApp? To share your invitation or digital card through WhatsApp, you'll want to copy the direct link to the invite/card and paste it into your WhatsApp message. If you have not sent out any invitations yet, head to the Add Guests page for your invitation where you'll see a box on along the right side of the screen. Click "Learn how" and you'll then see the direct link for the invitation on the next screen. Simply copy this link and paste it into a WhatsApp message to send guests the invite. If you have already sent out invitations, you can get the direct link from your Manage Invitation page by clicking the Share Invitation button. If you have not sent out any invitations yet, head to the Add Guests page and tap on the three dots in the upper righthand corner of the screen and select Share Invite. After that, you will be presented with different options and applications you can share your invitation to, including WhatsApp. If you have already sent out invitations, tap on the My Invites tab and select your invitation. From there, click on Manage Guests and then Add Guests. 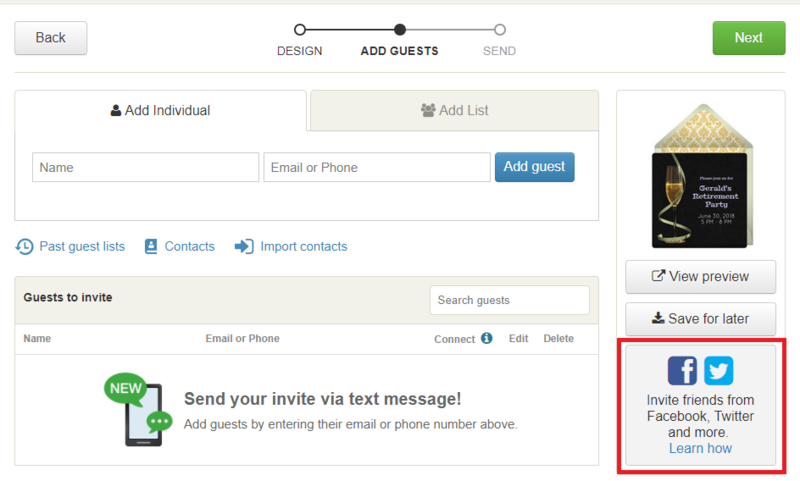 On the Add Guests screen, click on the three dots in the upper righthand corner of the screen and select Share Invite. From here, select WhatsApp from the list of different applications you can share your invitation to.